For many people, a student loan is the first debt they will ever incur. Borrowers may not understand how their loans work or the best way to repay them. The result? Student loan borrowers may pay much more than they have to and may stay in debt for longer than they need to. The standard repayment period for federal student loans is 10 years. Yet 2015 data shows that the majority of undergraduates who entered school in 1995 still owed a median of 22 percent of the amount borrowed. Only 38 percent of that group had fully repaid their loans. Let’s say you’re a college freshman and you’ve taken out $5,500 in federal direct unsubsidized loans with an annual interest rate of 5.05 percent. These loans do not require you to repay interest or principal as long as you’re enrolled at least half-time.However, interest does accumulate while you’re in school. The same is true for private student loans. 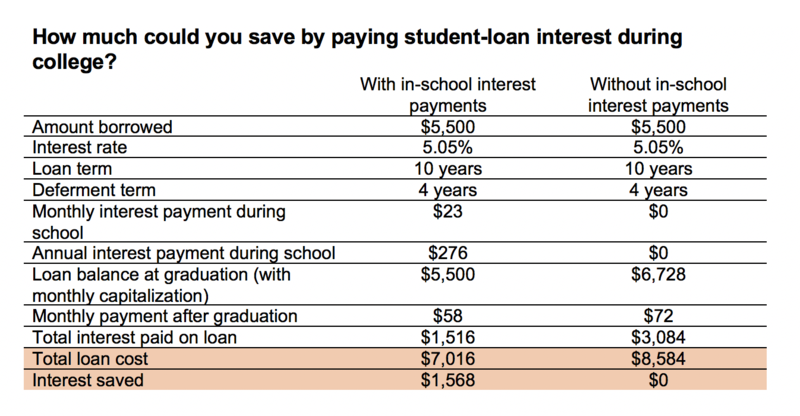 Only subsidized federal loans don’t accrue interest during enrollment. If you don’t pay interest on unsubsidized or private loans while you’re enrolled, that unpaid amount is added to your principal. This practice is called “capitalization.” When interest is capitalized, you end up paying interest on interest—not unlike the balance on a credit card that you carry over from month to month. By making interest-only payments during college, you can prevent your balance from ballooning. When you graduate, you’ll be looking at a much more manageable loan balance. The table below shows the financial benefit of making these payments. Even if you only earn the federal minimum wage of $7.25, you can make your monthly interest payment with just a few hours of work. “Make a small sacrifice now to help yourself out in a big way in the future,” said Brian Meiggs, founder of the personal finance site MyMillennialGuide.com. What could you do with an extra $1,568 at graduation? Pay an apartment deposit? Make a down payment on a used car? If you take out additional loans each year, your monthly interest payment will increase. You’ll need to work more hours to pay that additional interest. College students don’t always have the time to increase their work hours. And if you don’t, that’s okay. Since interest payments during enrollment are optional, you can reduce the amount, skip a month, or pay extra at any time. Any interest you’re able to pay while in school, even if it’s not all the interest that’s accumulating, will make you better off. College can certainly feel like a full-time job, especially if you’re taking a full course load or packing in an extra class to speed up your graduation date. You don’t want to overwhelm yourself and you should always place your coursework first. But you might be pleasantly surprised to learn that having a job can help you develop excellent time-management skills. Working can offer networking opportunities that can help you land a job after college. It can provide references who will vouch for you when you apply for full-time work. And there’s a good chance some of your coworkers will become your friends. Job searching can be an exciting and valuable component of your college journey. Options for young workers abound, and entry-level work can provide a glimpse into fields you might want to enter or avoid as a full-time career. Further, many on-campus jobs allow you to study when things are slow. You might actually be able to get paid for doing your coursework! Visit your school’s student service center. They’ll have experience guiding students like you to jobs. Inquire at places you’d like to work. Possible on-campus jobs include library monitor, campus tour guide, teaching assistant, grader, academic department assistant, tech support, and university bookstore employee. Possible off-campus jobs include babysitter, restaurant server, receptionist, bookkeeper, barista, and retail employee. Post flyers advertising your services. Could you help an international student with their English? Tutor another student in math? Help a high school student study for AP exams? Solve your classmates’ computer problems? Making interest payments while you’re enrolled doesn’t just have financial benefits. Keeping your student loan balance low can also broaden your opportunities after graduation. Here are four ways you might benefit. As a college graduate embarking on a career, you want to start down a path that has long-term potential for helping you reach your goals. Ideally, you’d have the flexibility to wait for the right position to come along and the flexibility to accept it even if you can’t negotiate a salary that’s as high as you’d like. “If you have a lot of student debt, you might feel you have to take a corporate or 9-to-5 job so that you can pay back the student debt ,” said wealth advisor Ryan Boggs with FourStar Wealth Advisors in Chicago. Of course, there’s nothing wrong with accepting a corporate job with standard hours. Many people enjoy the stability of this environment. What’s important is that you can put your own priorities first. “If you had little student debt, you might be able to take on jobs that have lower salaries, 100 percent commission, or even start your own business where the first couple years might be a bit of a tighter budget,” Boggs added. Many professions require a graduate degree or will pay you more if you have one. Graduate school can be an exciting opportunity to hone your skills, perhaps even more so if you aren’t stressed about undergraduate debt. Becoming a physician’s assistant or nurse practitioner can be a great way to enter the medical profession if you don’t want to go to medical school. However, these positions do require a master’s degree. In addition, managers, financial advisors, managing partners, database administrators, or marketing directors can earn 20 percent more if they have a master’s degree. These are just a few of many examples. If you’ve kept your undergraduate loans under control by making payments on them during school, then taking out additional loans for grad school to further pursue your career interests may be more feasible. If you want to buy a home, you’ll need enough for a down payment. A more positive financial picture increases the chances the bank will approve a mortgage. According to Boggs, high student loan payments count against you when applying for a mortgage and could keep you from being able to afford to purchase a home. Not everyone wants to have kids, and many couples are waiting until their early to mid-30s to do so. While that time might seem far off when you’re in college, it will arrive sooner than you think. Not being saddled with a monthly student loan payment can allow you to focus on the joys of starting a family and raising children instead of feeling stressed about the cost. Most college students haven’t had to support themselves or pay bills in the real world yet. Taking responsibility for student loan payments while you’re still in school is a great way to start getting used to the habits of adulting. Getting a jump on payments also forces you to acknowledge the reality of your loans right when you incur the debt instead of treating the loans like "free money" or something you'll "deal with" after graduation. Being present about your finances might help you resist the urge to spend beyond your means—something that tempts all of us. Making payments every month, however small, also gets you accustomed to making those payments on time (or accustomed to making sure you always have enough in your checking account to cover automatic payments). By making payments on your loans while you’re still in school, you'll graduate with good work habits, good time management skills, good financial habits, and a lower student loan balance. In short, you’ll be in a better position to start your adult life. You’ll have more freedom to pursue your dreams, whether they include grad school, travel, buying a home, starting a family, building a business, or anything else that’s important to you.